Wheat beers such as hefeweizen, weissbier and wit are all light beers made from a mix of malted barley and wheat. In southern Germany the typical hefeweizen is fermented with a non-flocculating yeast, and it is not filtered before bottling. This gives the beer a yeasty, bread like flavor accompanied by aromas reminiscent of banan, cloves (we’ve encountered that combo before), coriander and citrus. I’ve just begun to read up on brewing and my first batch of a partial mash hefeweizen is bubling along. As I pitched the liquid hefeweizen yeast into the wort I decided to keep a tiny amount for baking. If hefeweizen beer is reminiscent of bread, why not use the yeast for making bread? In particular I was curious whether some of the aroma top notes characterizing hefeweizen beer would stand out in bread made using the same yeast. The specific yeast I used was obtained as a liquid suspension from White labs. Their hefeweizen yeast strain (catalogue number WLP300) is identical to Weihenstephan 68. And in case you didn’t know – Weihenstephan is the world’s oldest brewery. Wine yeast is the same as beer yeast (or ale yeast to be more precise) and baker’s yeast – and they are all known under the latin name Saccharomyces cerevisiae (which literally translates to something like a “beer producing sugar munching fungi”). Why bother if they are all the same yeast you may ask. It’s a good question, but despite the common name they are different isolates with very different properties. They certainly have a lot in common: in the presence of air they consume sugars to grow, and in a closed environment without access to air the consumed sugars are instead converted to alcohol and carbon dioxide. But besides this main reaction there are hosts of other enzymes present that produce higher alcohols, aldehyes, acids, esters – all of them volatiles compounds that contribute significantly to flavor. And this is typically where the isolates of S. cerevisia differ. There’s a mind boggling array of beer yeasts available. Take a look at the yeast catalogues of White labs, Wyeast or Fermentis to get an idea of the many yeast strains that are available (note that the lists includes both ale yeasts S. cerevisia which are top fermenting and lager yeasts S. carlsbergensis which are bottom fermenting, meaning that the yeast sinks to the bottom when the job is done). And if this doesn’t impress you – consider the fact that there are thousands of S. cerevisia isolates available from culture collections around the world (ATCC and CBS are among the largest – do a search for S. cerevisiae at ATCC and it tells you to narrow your search because there are more than 5000 hits!). Apart from the specific strain used the fermentation conditions will also greatly influence the volatile profile: temperature, time, pH, micro and macro nutrients present, and the sugars available all have their say. A general advice for artisan breads is to use only a small amount of yeast (2-3 g) to start with and give the dough plenty of time to develop and rise. 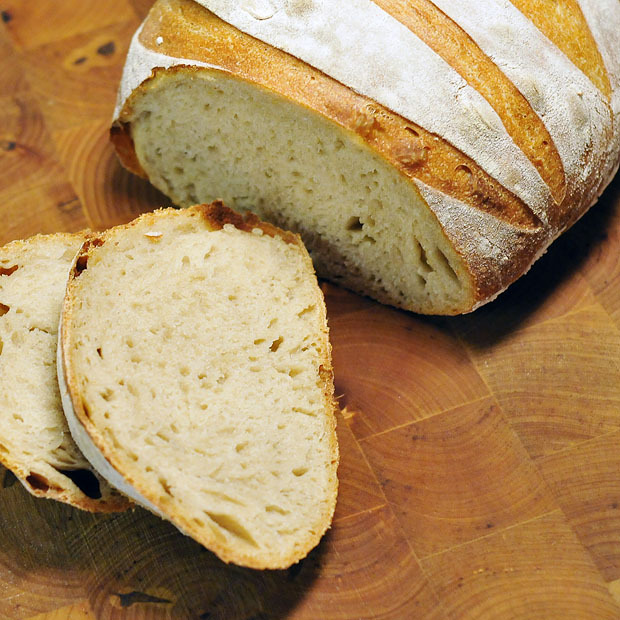 This gives a richer flavor compared to using 50 g of fresh yeast to obtain a rapid rise. Since I only started with about a 1/4 teaspoon of yeast slurry I first had to let the yeast grow and multiply. Since S. cerevisiae needs oxygen to grow I added 50 g of water to the yeast slurry and then used a hand mixer to whip in air for a minute or so before adding 50 g of flour. I left the pre-ferment (aka poolish or biga) on the benchtop and the next day there was plenty of bubbling activity. I added more water, whipped in more air with a hand mixer and once again added as much flour as water. This yielded an active starter and all was set for baking. Add water to starter and incorporate air with a hand mixer to give the yeast a good start. Mix in the flour, cover and leave at room temperature. Next day, mix all ingredients and leave to rise (this may take 1-3 hours). Divide in two, fold over repeatedly and shape into boules. Leave to rise. Preheat oven to 250 °C. Use a baking stone, and generate some steam in the oven during the first 10 min (see picture below). After 10 min, turn down to 220 °C and bake until crust has a nice golden crust. My current steam setup: I use ice cubes since this prevents a sudden gush of steam towards my hands. 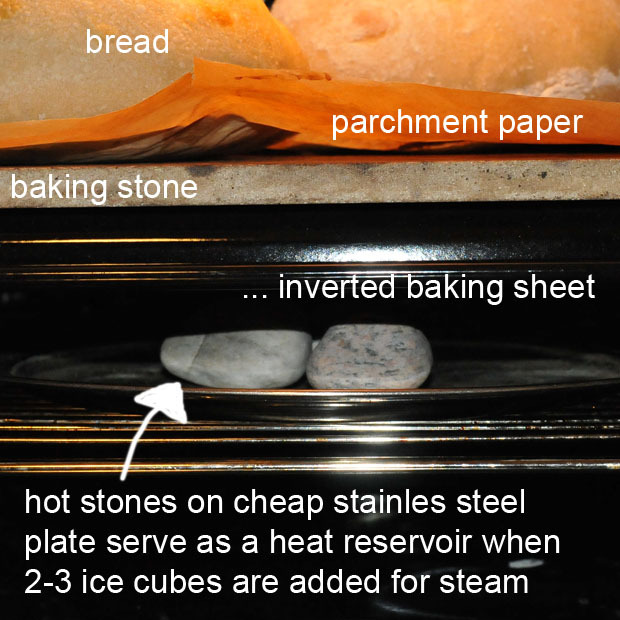 The stones serve as a heat reservoir ensuring that the ice cubes melt and evaporate within a couple of minutes. To cope with the heat shock I use a plate of stainless steel to hold the stones. After 10 min I open the oven door to vent out steam and remove the plate with the stones to allow an even heating (no reflection!) of the baking stone from below. So how did it taste? The bread tasted excellent, but to be honest – I couldn’t detect any aroma that I can’t get using conventional baker’s yeast. The reason for this is probably that other flavors (i.e. from the flour, the baking process etc.) dominate. Another factor is that bread is only fermented for a couple of hours compared to several days for beer. This simply doesn’t give enough time for significant concentrations of the volatile compounds to develop. Lastly, the baking process will drive off the most volatile compounds. Nevertheless, I would still encourage you to try this! I didn’t get the result I hoped for (I was a little optimistic), but it’s a fun experiment to do, especially if you have some yeast left over from beer brewing anyway. I am by no means the first to try this. But it seems that results are mixed. Some complain about slow rising doughs. But there are also many misconceptions around. One is that some yeasts produce more alcohol whereas other yeasts produce more gas. As long as we’re talking about anaerobic fermentation of sugar to ethanol and carbon dioxide this is plain wrong as ethanol and carbon dioxide are produced in a 1:1 ratio. There is also some confusion with regards to the naming (i.e. beer yeast, ale yeast, brewer’s yeast, baker’s yeast etc. – when all in fact are the same yeast). I haven’t had the opportunity to dig really into this, but from the abstracts it definitely seems to be the case that the selection of yeast strains also play a vital role in the resulting aroma profile of the beer. Looks good and tastes good! Some years ago, I played around with wine yeasts for making bread. I ended up with the same conclusion – it works, but never provided a difference in flavor. As you said, the other variables like the flour and the water just overwhelmed what tiny differences the yeast might have made. After 10 min, turn down to 220 °C and bake until crust has a nice golden crust. All volatiles, without exception are gone away, at this etage. Every yeast (S. cerevisae) is tryning to produce hugh ammount of beer in the best economic conditions, thus, every yeast is good to produce only one kind of beer, with local water, local malt formula and brew master experience. Nice the use of emmer (farro). JL Salgado: I guess that will depend a little on the definition of “volatiles”. 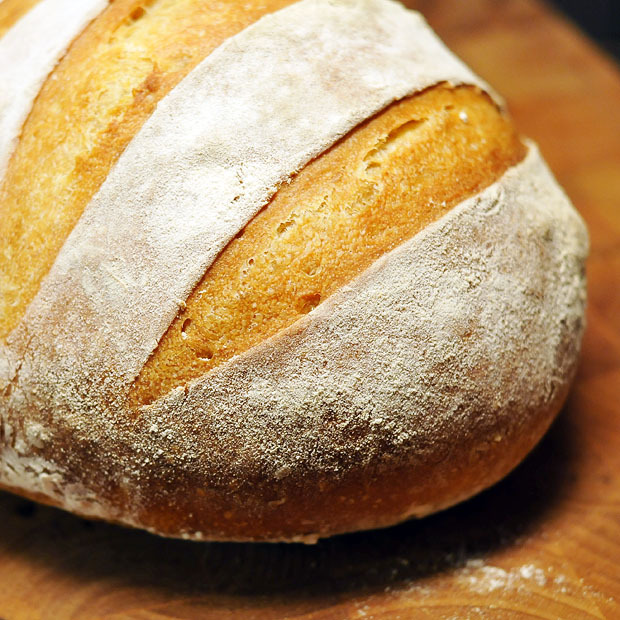 The core temperature of bread is typically around 92-95 °C when the bread is ready. So the amounts of volatiles left will depend both on their specific boiling point, but also on how fast they diffuse through the bread matrix. The fact that bread can have a strong aroma suggests to me that a significant amount of volatiles remain in the bread – but as I said, that will depend on how you define volatile. 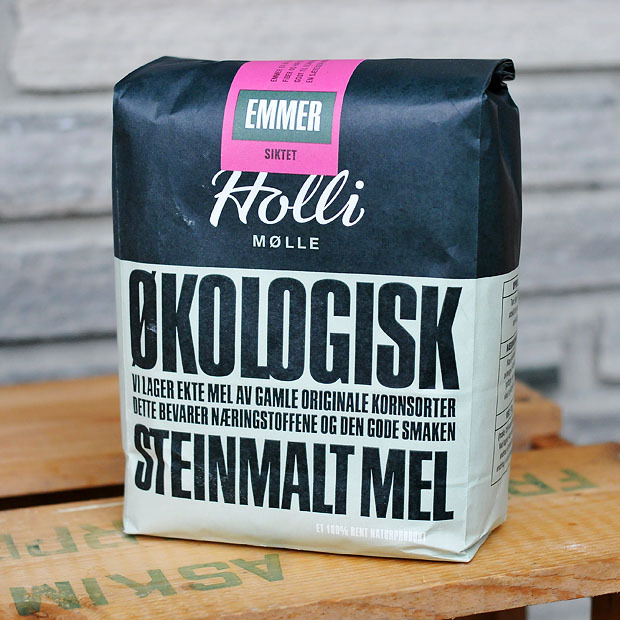 BTW: are you aware of any papers on retention of volatiles during baking? You are rigth. During the bread coolling, you can feel a lot of aroma, it is due to enthapy of vaporization, that continue evaporating water, alcohol -from yeast fermentation- and a lot of substances, that is the reason of cooling. The enthalpy of evaporation of water is the highest, and water is the last one to vaporized, that is the reason why you need an oven over 200ºC. To keep aroma after cooking they must by added solved into oil or grease as a base or resinoid base. A good example is the Danish pastry, scent very well to butter, due to its high grease contents; or use seeds, grease seeds, like sunflower or similar, its content in grease help to scent. Try to solve essential oils on lard, shortening and so, part of scent will be lost during cooking, but it will remain enoug after cooling. It has been a pleasure to talk with you. JL Salgado : I must respectfully disagree with your assertion that the heat from baking drives away all volatiles from the bread, unless there is an organic solvent added to the bread to retain them. In even the most simple of breads, with no oily fraction for volatiles to partition into- for example, a baguette made of only yeast, flour, and water – there is an aroma to the bread after it comes out of the oven, even after it has cooled and sat around for a day. If it has an aroma, it must contain volatiles. I would imagine that a large fraction of aroma-active volatiles would evaporate during baking, however, some pool of volatiles remain in sufficient concentrations to give the bread some aroma. 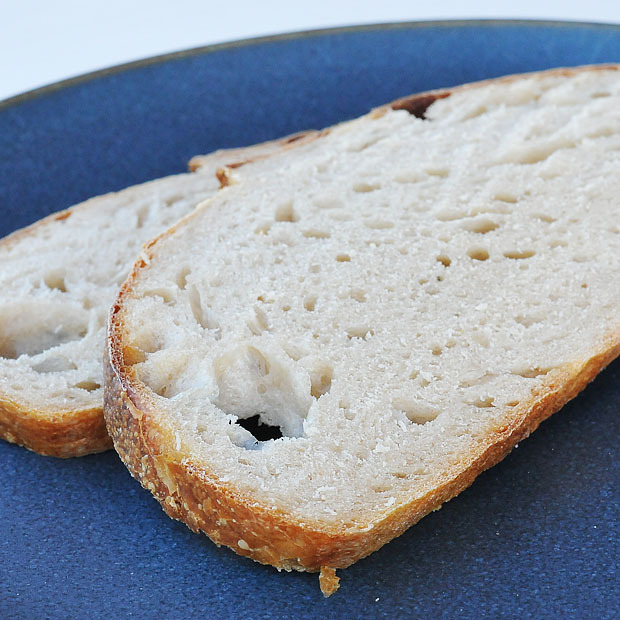 In this paper they found that roughly 12.5% of the volatiles found in the unbaked dough remained after baking, and also that the method for leavening (in this case, mixed starters involving yeast strains and lactobacilli) caused chemical differences in the bread that were still evident after baking, though I don’t think they examined whether this had any sensory impact. I would imagine that, during bread baking, many of the yeast-derived volatiles would indeed tend to evaporate or be chemically altered by the heat. What might be interesting would be to bake several different loaves at once, with identical ingredients and technique but varying the yeast strain, then comparing them blind in various ways to see if a difference existed. 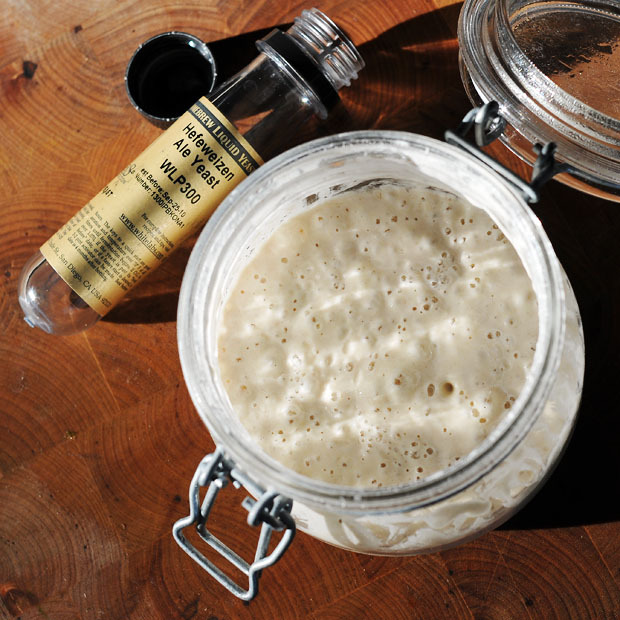 Bread and wild (sourdough) yeasts are known for having too much flavor to be used for brewing, which might explain why the bread didn’t taste too much different when using an ale yeast (if anything, it should have less yeast flavor). Most of the yeast flavor I taste left over in bread is the yeast itself, not the esters that it creates during fermentation. I have no proof, but I suspect that the lack of distinguishing flavor has more to do with the relatively short fermentation period for bread (beers with strong esters take weeks or even months of fermentation to develop their yeast-provided flavor). On the other hand, if you use bread yeast when making beer, you will usually get something with a lot of banana type esters, reminiscent of Belgian style ales, but not as refined. Though most brewers would probably turn their noses up at the idea of brewing with bread yeast, ciders and meads can actually turn out quite delicious (I’ve posted a friend’s recipe at http://forevermore.net/articles/hard-cider-recipe/ if anyone would like to try it). and most important parameter is flour freshness, no more than one week since milling, as starch and protein are spoiled with oxigen, air humidity, bacteria and mould contamination, hat produce off-flavour and off-odours. Remember that flour is still alive and enzymatic activity occurs, that only stops when heating enough. So, the best aroma control should be done during the raw material selection. The use of emmer (farro) is the main point of this post in my opinion. 1) S. cerevisiae varieties really aren’t all that different. There’s a small difference in their fatty acid profiles and in small molecules produced, but these are relatively small. 2) Proportionately, they’re not fermenting that much in bread. When you’re making beer, you’re trying to convert most (all?) of the sugar into ethanol. When you’re making bread, you’re trying to make sufficient bubbles to get the bread to rise. Imagine fermenting your beer for 3 hours with 2 different yeasts, and then trying to taste the difference. They’d both taste like mash. You wouldn’t be able to tell them apart. Secondly, in Norway (and probably elsewhere) it was customary to use ale/beer yeast in bread. Saved the foam on top or precipitate on decorated wooden sticks for the next brewing (the yeast dries out and hibernates until next soaking in water/wort). Finally, seem to remember reading that the romans were rather envious of the barbaric peoples living in Spain etc. because of their well leavened bread made from ale/beer yeast (Romans mainly produced wine and weren’t able to utilize the yeast in the same way). Don’t know if it’s just an anecdote or not, but a fun story anyway. Nice looking bread. I make bread with the “sludge” at the bottom of the fermentation bucket everytime I brew beer. Give it a shot when you bottle this one. It does have a bit more character than using the straight yeast from the package like you did. It’s not that dramatically different than using regular yeast or anything, but it is a cool way to be resourceful and use up a cup ro so of the beer “sludge”. I’m surprised that your bread rises using the lees, E. Nassar. The lees (“sludge”) are made up mostly of dead yeast cells, so the bread shouldn’t rise. If it seems as if it’s rising too slowly, you can probably bolster the rising by adding a bit of conventional yeast. Well, sorry about that but I guess I neglected to say that I use the sludge to make a “starter” (maybe 1/2 cup lees to 1 cup flour and 1 cup water). I use that to make bread and it rises nicely. I think the key is that like you said the lees consists of mostly, but not all, dead yeast. If all yeast are dead at the end of fermentation then bottle carbonation should not occur either. I’m assuming you then let this starter sit for a while, similar to sourdough? If this is the case, whatever live yeast you managed to get from the lees would have a chance to proliferate. The lees contain the dead yeast cells, but the beer still has live yeast suspended in the liquid. That’s why the bottle carbonation can occur. If the carbonation was dependent on yeast in the lees most beers would not be carbonated, because only a few are bottled with the lees. Yes you are correct, Rob. I let it sit until foamy (24 hoiurs or so) and then use. The sludge I use is basically made up from lees and whatever little beer I did not siphon off. @ Rob Handel quite the oppoiste. There is no better fermentation that I have seen then pitching my wort on top of a yeast cake(sludge). These yeast cells are not dead by any means. I have never tried baking with this yeast, but I am going to try this weekend making some pretzels in my clay pizza oven using a yeast cake from a pale ale I recently kegged. Daniel- The lees are comprised of mostly dead yeast cells. I’m sure that there are some live yeast down there, but the bulk of it is dead. The dead yeast does act as a source of nutrients however, and that is probably why you get a good fermentation with it. I know that when I make a mash for distilling I’ll often make a “jump start” solution using some bakers yeast sugar and water that I boil to kill the yeast cells. This contributes enough nutrients to get whatever live yeast I add going really good. BTW- Pretzels with the pale ale lees sound good. Hopefully you manage to pick up enough ale flavor. Maybe I can do some kind of yeast starter or maybe some corn sugar and warm warm water. I’m very stoked about the pretzels. I had some at a restaurant flown in from Munich and I cant get them off my mind. I’d be happy if mine turned out half as good as those. I’m sure that something like that would work, but I don’t think you would need one for the beer. Like I said, I use mine when I make a mash that I’m going to distill, which means as soon as it’s done bubbling, it’s into the still. When you’re making beer (or at least when I do it) I leave mine in my primary fermenter until it is done bubbling, then depending on whether I want to leave it on the lees or not, I either let it age for a couple weeks there or transfer it to a secondary fermentor to age for a few weeks. Either way, my point is that beer needs to age to a certain degree before it’s really drinkable, whereas mash for distilling doesn’t. This means that you have plenty of time to let it ferment without a starter. Good luck on the pretzels and let us know how they turn out. I just might have to try turning out a batch myself! Instead of using ice cubes and stones for generating steam you should try to use lava rocks made for gas-grills. Preheat them in a pan in the oven and add water, produces excellent steam over time. The first is that a wheat mash (similar to a poolish/starter/preferment) contains small amounts of free amino nitrogen necessary for good yeast health. Perhaps the character of this yeast strain is not well represented because the fermentation is not as strong. Secondly, the yeast cake at the bottom of a fermentation vessel is really mostly dormant cells not so much dead yeast.